Have you Heard the Wu? Dude, Did You See That Sound!? The video game Assassin's Creed III by Ubisoft, which was released October 30, 2012, is the latest installment of the Assassin’s Creed series. As a quick side note, this may contain spoiler alerts to anyone who wants to play the game. Now I have not beaten this game yet, but I have been trying to take a close look at the audio while enjoying the game at the same time. So much has progressed in the world of video game audio. Leading games in the industry like Call of Duty, Halo, and Assassin’s Creed seem to take great care in making sure that the customers have a great auditory experience. Evolving from the humble beginnings of 8-bit audio, we now live in a world where surround sound in video games is a standard. 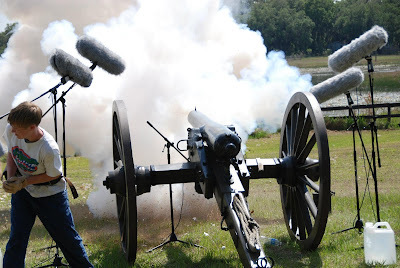 Multiple microphones are common on just a small sound source, and even more are used on the big ones like the cannons used in Assassin’s Creed III. So what about this game? Well, the audio seems top notch. I feel as if while walking the streets of Boston in 1775, I am actually there. There are animals, people talking, wind blowing, and more. Overall, it is recorded well, compressed well, mixed well, and implemented well. I have noticed some instances where the audio seems a little subpar. Did you know you can pet the animals in the game? Well, pet the cat and you’ll notice it makes the same sound each time. No big deal; that’s not the focus of the game. What is though is the story told by Juno to Desmond in the game. There are a few instances though where is audio of the imagery (specifically the sound effects of the sun) overpowered the vocals. 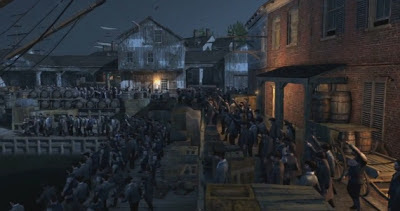 In the Boston Tea Party level, there is an enormous crowd that gathers throwing fists in the air and expressing the gratitude toward the action of throwing the tea over. With such a large excited crowd, one would expect them to be loud right? Well, this crown seemed to be all “walk” and no “talk” because they were dead silent. Music plays a great part in video games. It can be used to let the player know he or she is in danger, convey emotions, and alert to a victory. Lorne Balfe did a very good job at composing the music for this game. The mixing however, seemed too much at times. Occasionally, I would be walking in the snow covered empty woods, and music will start blasting out of nowhere as if I was in a battle. Perhaps the enemy was near to trigger it, but the volume of it was unnecessary. For most of these points, it is obvious that I am being VERY picky. The audio of this game is very high quality, as well of the game itself. As I have mentioned before in a previous post, it does only take the little things for the experience to be ruined. It will take much more then a silent crown and some music to have this game ruined for me, but I will say that if I have to read anymore white subtitles on a white background, I will be pretty ticked off.